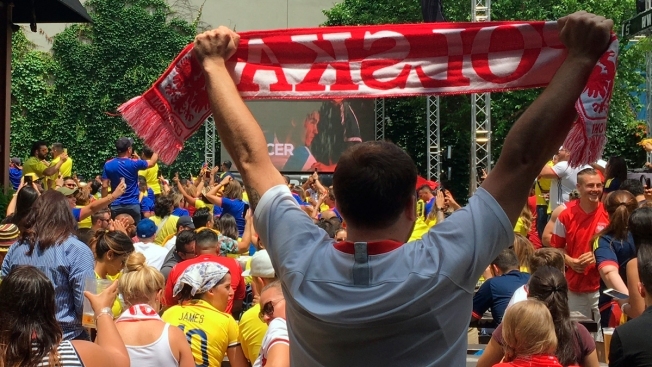 FILE - A fan of Poland holds up a scarf as he watches a World Cup soccer match between Poland and Colombia at The Garden at Studio Square NYC in New York on Sunday, June 24, 2018. Excluding games involving the U.S. team in previous World Cups, the average declined 28 percent from the 2014 tournament in Brazil. Most group-stage kickoff times this year were morning EDT, starting as early as 6 a.m.
Spanish-language coverage for Telemundo and Universo, both part of Comcast Corp.'s NBCUniversal Inc., averaged 1.96 million viewers, including digital streaming. That was down 26 percent from the 2.64 million average on Univision and Unimas four years ago and up 7 percent from the 1.84 million average for Univision's networks in 2010.